Here in Virginia every county and public hunting land seems to have slightly different game laws. The seasons, bag limits, and hunting methods can vary widely from one county to another. I hunt in over a dozen different counties, so before I go out each time I make sure to double check the regulations for where I am going. Last week I went scouting at the Chickahominy WMA. Before I left, I checked the rules for that particular WMA, in case there were any off limit areas or other rules I needed to be aware of. As I was reading the rules I noticed a new, big one. 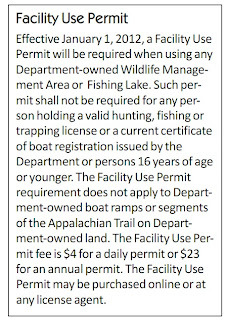 Starting January 1, 2012 everyone who does not have a hunting, fishing, trapping license, or has registered a boat, will need to purchase a Facility Use Permit. 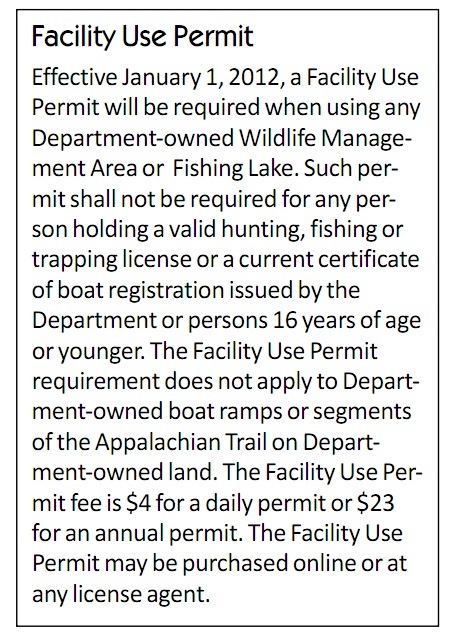 A Facility Use Permit costs the same as a hunting license; $23. Before I talk about some of the ramifications of this, let me explain Virginia's WMAs. Wildlife Management Areas are bought and maintained by Hunting and Fishing license funds. They are primarily for hunting and fishing, but anyone is allowed to use them. Primitive camping is allowed on many of them. They are popular sites for bird watching and geocaching. Some host quota hunts and are closed to the public during hunting season. Most are open to everyone at all times. Recently, the fact that anyone can freely use these lands has become a sore spot to many hunters. We pay for the property and to maintain the roads, but someone who has never paid a dime into the system can walk onto them anytime they want. I have heard complaints about bird watchers disturbing bow hunters in the field. I know of one WMA that restricts where you can hunt due to bird watchers. Apparently these complaints have been heard. After January 1st you will not be able to access these lands without paying. My first reaction to this was negative. My wife and I like to geocache. Now I will have to buy her a permit to go on WMAs. When my girls get older (over 16), I will have to pay for them. I can see how this could be a hardship to some families. However, the more I think about it the more I like it. It is only fair that everyone pays for access. $23 for a years permit is not expensive. When they get old enough I hope to have my girls hunting and fishing, so I really won't be paying anything extra for them. Will this permit make things better for hunters? Probably not. The people that use these lands won't have a problem forking out $23, if anything they will feel more entitled to the land. Time will tell. I hope that it will increase the amount of money going into the system, allowing the DGIF to purchase and maintain even more properties. Eastern Virginia is really hurting for places to hunt, hopefully they will open some more up around here!